Sync Outlook on two or multiple computers via USB. 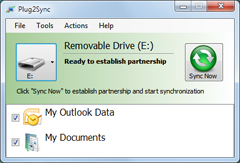 Plug2Sync and Backup: An easy way for syncing Outlook on multiple computers via USB. Plug2Sync and Backup is a simple, yet powerful, sync and backup software solution which will give Outlook users an invaluable feature: synchronizing Outlook via USB. If you are using Microsoft Outlook on two or multiple computers, using a synchronization solution that can sync Outlook between computers can save you a lot of time and energy and help you stay better organized regardless of which computer you are using. Plug2Sync and Backup makes this especially easy and fast by avoiding to use the internet for syncing Outlook on your computers, and instead making it possible through the use of USB devices, such as flash drives or other removable storage devices. Using Plug2Sync and Backup it’s possible to sync emails, calendars, contacts, tasks, notes, journals and other Outlook folders and have the same synchronized data easily available to you on every computer where you use Microsoft Outlook. It is also possible to schedule synchronization and sync Outlook automatically, just as easy as performing a manual sync. Microsoft Outlook sharing and synchronization using your USB drive. Start Plug2Sync and Backup and select the drive/device where the synchronized files will be copied (usually USB flash drive). Check ‘My Outlook Data’ in the list of folders to synchronize. If you want just specific Outlook folders to be synchronized between computers you can select the folders by pressing the “What I Sync” button. Press “Sync Now” button to start the Outlook data synchronization. Unplug the USB drive and connect it to another computer. Repeat the steps above. You can read more detailed information about syncing Outlook and sharing Outlook folders by accessing the Plug2Sync and Backup software documentation. Using Plug2Sync and Backup in order to sync Outlook emails, calendars, contacts, tasks, journals and other folders can prove to be a very smart decision which can save a lot of time and energy in many situations. It is the easiest way to share Outlook data with friends, co-workers or family members, or just to restore Outlook data after a fresh installation of Microsoft Outlook, or when you are starting to use a new computer. Sync .pst files on PCs, laptops and Windows 8 Tablets. Synchronizing .pst files is the easiest way to sync Outlook data. The most common problem encountered in this case is the fact that .pst files are large files and they are locked most of the time. Plug2Sync and Backup offers a reliable solution to sync pst files between PCs, laptops and even Windows 8 tablets, while solving both of these problems and avoiding additional security risks which can appear while syncing pst files over the internet. Because Plug2Sync and Backup uses removable storage devices to transfer synchronized files between two or more computers, laptops, netbooks or Win 8 tablets, security risks are avoided and the speed for synchronizing pst files is much higher. If you are looking for a quick and reliable solution to sync pst files, or just to back up pst files, Plug2Sync and Backup will overdeliver by offering you a wide range of possibilities for synchronizing and backing up files and folders as well as Outlook data, both manually and automatically.